Slate serving tray with stainless steel chilli shaped handles, with pad on base to protect your surfaces. 42cm x 15cm (approx 16 inches x 6 inches). Made in Scotland. 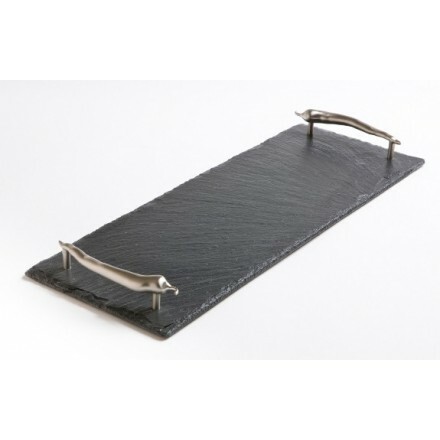 Ideal as a cheese board or for serving sushi, canapes, sweet treats nibbles or even breakfast in bed! Sealed with a food safe laquer. Stainlesss steel chilli handles stand proud enabling easy transportation...42cm x 15cm (approx 16 inches x 6 inches). Please note that the slate is heat resistant up to 200 degrees centrigrade. To clean use a mild kitchen cleaner and a damp cloth. Comes boxed, ideal housewarming gift.